Without me, but with BOTH boys!! 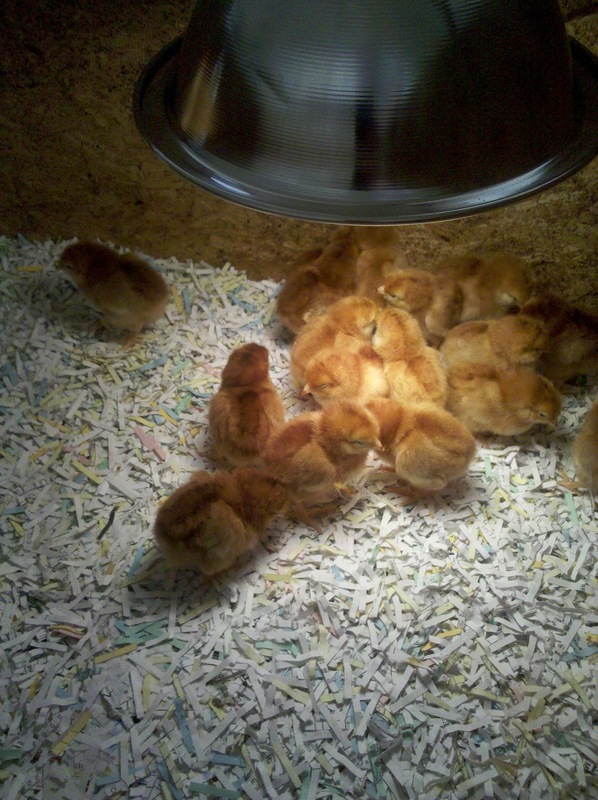 Thank goodness Saturday we had gotten the brooder ready. All Hubby and the boys had to do was put the chicks in the brooder and fill up the waterer and feeders. Are they not the cutest things?? 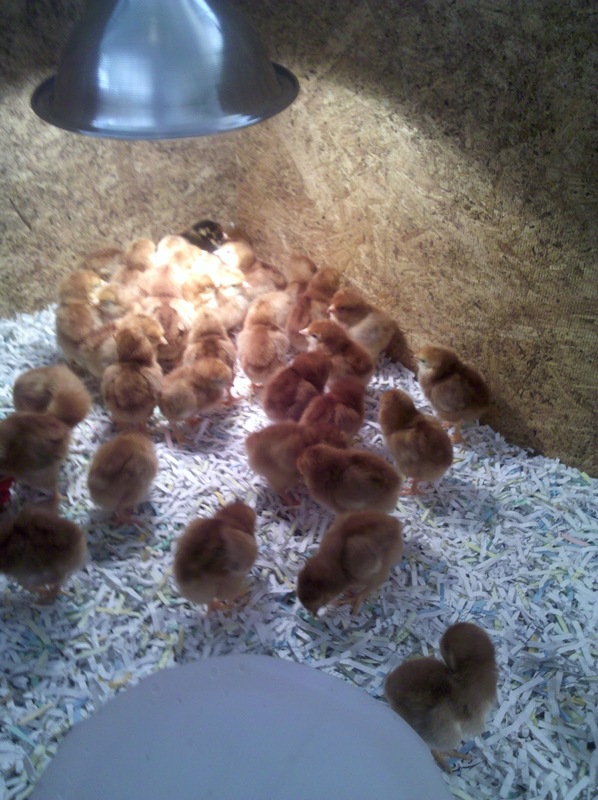 We'll be keeping them in the brooder for the next 4 weeks and then we'll move them out to the pasture. Hopefully by August we'll be in the fresh pastured egg business! Hamp is loving watching after our new chicks too! Head over to see my friend Sharlene at Rockin' Chair Reflections. She mentioned me in her lastest post!! Hi Frugal Tractor Mom! I'm a new reader. Love your new chicks! My family raised chickens when I was growing up. What kind are they? 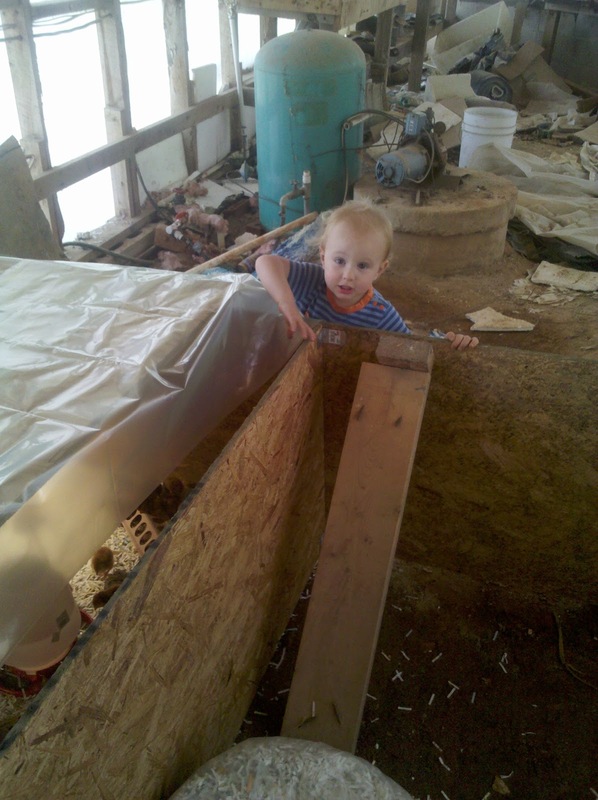 Is your brooder in a garage or outbuilding or??? We used to keep ours in our unfinished basement until our MN weather warmed up. Liked your Ash Wed post too. Read it to my kids. Hi there! Thanks for your visit and comment tonight. I hope you'll stop by again. I've enjoyed my visit here. These are the exciting times. I love the little chicks. Haven't raised a brood in many years, but it was well worth it while the family was growing. Start collecting egg recipes, now! Keep us posted. P.S. I've always admired the folks who played the hand bells. Do you have a cd? Adorable little chickies! Thank you for joining the I ♥ Blogging Hop, I'm following you on FB and NB. HAGW! Aaawww - they are so sweet. Awww! How cute! Good Luck. I hope everything works out. A lot of people around here have chickens and sell their eggs. Have a great Wednesday!